Last week was Thanksgiving. I have always loved this holiday because it is all about quality time with loved ones and being thankful for what the Lord has given. And a parade. And turkey. But mostly loved ones. It was pretty difficult on Thursday to be apart from our parents, brothers (and sister-in-law), grandparents, extended family, and close friends. Empa (but), we had many great distractions that kept the focus of our day far from missing home. Saturday, Tyler and I drove to Johannesburg to pick up our first team from Summit Church in Petal, Mississippi. We had been praying and planning for this team since we got here in September. We felt lots of excitement along with tons of nervousness. This blog post will give everyone a glimpse of what a mission trip week is like for us. It was busy, but so good! We pray this post will plant a seed in your heart and stir you to want to be a part of what the Lord is doing here. This day was devoted to making our way up the mountain. We left early in the morning from Johannesburg. After a few hours of driving we had a delicious breakfast at a lion park! The team really enjoyed seeing their leader get spooked when the biggest lion wanted to tell him hello. After about five more hours in the car we finally made it home to find hot taco soup and Christmas decorations (thanks Anna, Bek, and Mic for the soup). We got everyone settled into their rooms, had a brief time of orientation, and got a good night’s rest before the busy week. We started the day with a complete orientation for the team. The Flora’s and Barnhill’s helped us gather all the information we needed to go over. Tyler put together an extensive document with everything on it. It was a long morning of hearing Tyler’s voice, but the team seemed to appreciate the cultural and religious background on Lesotho. Then we took the team down to the Love Poppy room where they met MmeMookho and all the BoMme (women) who make the ornaments and jewelry. We picked up MmeMookho, drove to the closest Care Center to gather the other BoMme, and headed to MmeMaTumo’s house. MmeMaTumo is the grandmother to Tswanelo (TSwaan-ell-oh) and Motsilisi (Moots-see-dee-see), two awesome children who attend Khokhoba Care Center. 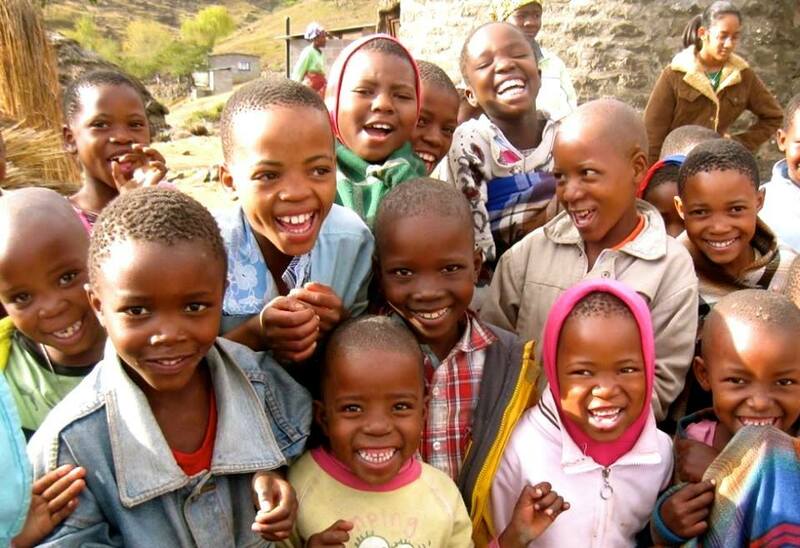 This home visit allowed the team to see what village life is like for the Basotho. They also had the opportunity to meet two of the kids from the Care Center at their home and encourage their grandmother. Molly did a great job sharing The 2 Kingdoms and Lenette shared her testimony. God has been calling her to serve in Africa for over 45 years, and she jumped in and shared without hesitation! It was a great first time out for the team. Tyler and I could tell we were going to have a great week with them! That afternoon, we went to Khohlo-Ntso Care Center. We introduced all the shy kids to their new friends from America by playing a name game with a ball. The team brought over a whole suitcase full of Legos and the kids were in heaven after they were dumped all over the floor! When it was time for centers, they jumped right in and did a great job interacting with the kids. The team had a Bible story and craft prepared as well. They taught the story of Jesus calming the storm and emphasized that “Jesus is my Peace”. Jeremy, one of the BoNtate (men) from the team, even had the kids “making rain” with their hands by making different noises resembling the sounds of rain. The kids loved it! We went to Khohlo-Ntso Care Center early in the morning to have teacher training with the BoMme. A couple of the adults on the team are teachers in America. They had some manipulatives and strategies for us to use while teaching the kids Math, English, and Bible. They did an outstanding job! The BoMme learned so much and really appreciated the encouragement they received (and us too). While teacher training was going on, Tyler took some of the guys to tag 50 chickens. They used zip-ties to make a colorful bracelet for identifying the older chickens from the first batch. Don’t tell the poor birds, but these bracelets mark the ones who will be supper first (once their egg production begins to decline). Ntate Pokah also used their help weeding the field where they have planted corn for the Care Center. Those guys had a long, hot morning but did a great job. During teacher training, Matsietsi (Mats-see-et-see) came to the Center. She has finished 7th grade and has plans to go to high school in Janurary. When we all left for lunch, we brought her along with us. The girls from the team did great at spoiling her. Matsietsi’s face lit up when she found out that Molly is 14 and Maggie is 15, they are so close to her own age. After lunch was one of the highlights of our week! The week before the team came we visited the primary school that most of our kids attend. Our intention was to ask if they could let our kids out a bit early. Because the team was going to be here, we wanted the kids to come play with us at the Care Center as soon as they could. While we were meeting with the principal, he expressed to us how much he loves it when teams come to the school and play with the kids. He asked us what day we were planning to come with the team to visit the kids at the school. Of course, me and my big mouth committed to Tuesday afternoon. As we walked to our car after the meeting, Tyler asked what my plan was for that time. I had no answer. So, when we told the team about this opportunity during our Sunday evening orientation we were worried they would be stressed out by the addition to the plans. But no, they were ecstatic about sharing the Gospel with over 300 children! It was amazing to see their energy and excitement about something we just sprung on them. They planned three stations and split the kids into three groups (by age). One station played a giant game of tag, one station sang songs (in English and Sesotho), and the last station told stories about holidays in America and Lesotho (you know, because it’s Thanksgiving week and all). And at the end of our time we all gathered together and the whole team acted out a skit that told the complete gospel story. It was great! Tyler says his favorite part was looking through the crowd of faces and seeing the few that we knew from the Care Center. It was cool to see them interacting, playing, and learning with their friends. That afternoon, we spent time back at Khohlo-Ntso Care Center trying out the new strategies and materials the BoMme had just learned at teacher training. They did such a good job and the centers were run very well. We could also tell a difference in the kids after being with the team the previous day. This Center is known to be a bit more reserved and shy, so it was neat to see the kids open up a little bit more now that they were becoming more comfortable. The team shared the Bible story about the paralyzed man whose friends brought him to see Jesus by opening up a hole in the roof. The kids were hooked on this story; they listened so well. After another cute craft, this one involving a “paralyzed man” on a paper bag mat, the kids had a firm understanding that “Jesus is my Healer”. It was a full day. With pancakes and breakfast pizza filling every inch of our bellies for dinner, it was time for a much needed nights sleep. I have to include this picture, because, this man was a lifesaver to me. Every meal he was hands on doing whatever needed to be done. I could not have done it all week without his help. Thankful for him! Food delivery day! We wanted to take our team to see what Jim and Teresa Flora do for the BGR (Baptist Global Response) food deliveries. But first, we wanted to let the women on the team spend some time with the Love Poppy women who were sewing stars. Shanna shared a devotion with the women and we all shared in fellowship and singing. It was a really special way to start the day, both for our team, and for the women who were about to start their work. When in Africa, plans rarely go as planned. Let’s just leave it as that. This day (at least the food delivery part) did not go as I had planned. But in all things, God’s hand is on it and it turned into a great experience for the team. We ended up loading 35 food packs and heading to the Motsuko Valley. We had planned to go just up the road, but this change in plans extended our travel time by about 50 minutes each way. It turned out fine, and the team was able to share The 2 Kingdoms (while performing the skit from the afternoon at the school) and Sabrina shared her testimony. The people in the crowd were very receptive and many seeds were planted. We were so grateful for the team’s willingness to jump in and help with this delivery. We rushed back for the team’s first afternoon at KhoKhoba Care Center. We played some keep away, BoAbouti (boys) versus BoOusi (girls), and they warmed up to their new friends very fast. The team jumped in and really took special attention to a few of the kids with special needs. Ntene (deaf) and Tsiliso (down syndrome) lit up while they received the extra help they crave. They shared the same Bible story and craft from Monday. Because there are two Care Centers, it made the planning a bit easier as some days can just be duplicated. The kids at KhoKhoba learned that “Jesus is my Peace”. Another great day! By this point we were getting spoiled rotten by just how helpful and flexible this team was and Tyler began to seriously considered hiding their passports so they couldn’t leave! Happy Thanksgiving! Today we had another full day of ministry, no holiday break for us! We started out by going to the lodge (hotel near our house that serves breakfast and has free WIFI). After a good breakfast and some pictures by the reservoir, it was time to officially get started. We held teacher training at Khokhoba Care Center in the morning. Again, the teachers on the team did a fantastic job going through everything with the BoMme. The BoMme were listening so intently and we could tell they wanted to learn new and better ways to help the kiddos. It was great encouragement for Tyler and I. While teacher training was taking place, Tyler and some of the guys from the team excused themselves to go tag the 50 chickens at this Center. Tyler was happy to have the help, they are quick and sneaky and having four people catching and zip-tying made the process go a lot smoother. After the chickens were done, two of the youth boys on the team, Colton and Bryton, walked down the mountain to the closest well to get water for the chickens. So helpful! Teacher training took most of the morning, so when the BoMme had no more questions, we excused ourselves for lunch. After a quick break we all came right back to the Care Center for the afternoon. Because it was Thanksgiving and we had a lot of food to cook, Tyler and I tag teamed kitchen duty and time at the Care Center throughout the afternoon. If you were to look at the team, you would think they had been working in Africa with these kids for way more than just four days. They were so comfortable, getting right on the floor and playing with them, speaking to them with such love and respect. The kids responded so well being with them, and listened so intently to the Bible story. Today was a repeat of the paralyzed man story. By the end of the day, after all the games and crafts, and through all the giggles and smiles, the kids knew that “Jesus is my Healer”. After everyone got cleaned up from the day, we went to the Flora’s house for Thanksgiving dinner. It was such a special time for Tyler and I to be able to be with them and at their house. Like I said before, Thanksgiving is meant to be shared with family and I was sad not to be with our family that evening. So, it was great to be able to share the holiday with our new Lesotho family. The team also had a great time. They said they didn’t expect to have a Thanksgiving meal so they were pleasantly surprised when they saw the spread of food the Flora’s had prepared for us. We are so thankful for that special family! For the team’s last day in Lesotho, we decided to split them up into two groups. First, we headed out to get all the food we needed for the kids’ weekend food packs. After the food had been purchased, we divided the team into two cars and went on our separate ways. Tyler took half the team to Khohlo-Ntso while I took the other half to Khokhoba for home visits. Tyler’s group went to Motsilisi’s (Moots-see-dee-see) house where Jeremy taught the gospel and Maggie shared her testimony. Motsilisi’s grandmother was receptive but upon understanding all she would have to give up (ancestor worship, belief in witchdoctors, etc.) she was not willing to be born again. It’s hard to watch someone turn down the gospel, but it is not our job to force someone to accept Christ when they aren’t willing to follow him completely. The team did a great job explaining what following Christ means and that it’s not a decision to make half heartedly, it’s a full commitment. We pray the seeds that were planted will take root in her heart. We are also planning to stop back in to follow up with her soon! Rachel’s group went to Tspang’s (TSay-pong) house. Colton and Bryton prayed, Shanna shared her testimony, and Molly shared The 2 Kingdoms. As they were sharing, more women came up to listen. After they finished sharing, two of the women (one of them being Tspang’s grandmother) told us they wanted to be born again. MeMakefuoe spoke with them about giving up everything they worship and believe in and putting their complete trust in God. Jeremy, from the team, prayed with them to accepted Christ and to be born again! We gave them a card with scriptures in Sesotho and gave their phone numbers to Ntate Molapo (pastor of Khokhoba Baptist Church). He will follow up with them as well and get them plugged into discipleship at the church. Tyler and I plan to visit both houses again to follow up with the decisions made. In caring for these children, we pray that God will touch the lives of their caregivers as well. Doing home visits is one way we can share life and Christ with them. On the way back to the house for lunch, Tyler’s group picked up Limonta (De-mon-ta) and had her come over for lunch. Lenette and Sabrina wanted to spoil this little one and gave her a bath and new clothes! When I got back from the home visit to Tspang’s house, I walked in the bedroom and saw her sitting wrapped up in a blanket next to a heater. I almost started crying. She was so sweet getting warm while Lenette picked out clothes from her suitcase and Sabrina scrubbed the tub from the dirt that came off of her. I really loved seeing them love on this girl. She sure has a special place in my heart. In the afternoon, we headed out to the Care Centers. We stayed split up so that all the kids could have one more day with their new friends from America. It was bittersweet because this was their last afternoon. The hit of the day was a fun game of hot potato, which all the kids took very seriously. The lesson for the day was about how “Jesus is my Savior”. The kids learned about Jesus dying to take the punishment for our sins and rising on the third day. One of the older boys at Khohlo-Ntso said that his favorite part of the day was learning about the resurrection of Jesus. After the craft and family circle, it was time to head home. After dinner and our last night of debrief, we surprised the team by taking them back to the school we had visited on Tuesday. Nobody was there, but because that valley doesn’t have power, it is incredible to look up and see the unhindered sky. Without light pollution, there are countless stars in the sky, and once your eyes adjust you can even make out the milky way. It was a great way to end their time in Lesotho, the Kingdom in the Sky. So here we are a week later. The team is safely home and working to get over their jet lag. This week has been a bit busy, hence why this post is just now getting out. The kids are now on Holiday break and are at the Centers for a full day. We love having the extra time with them! We are also eagerly awaiting Brett and Allison’s return today from Zimbabwe. There is so much to get done, but we are so happy to have more hands helping us for a few months. Over the coming weeks, please be praying specifically for Ntene (the boy who is deaf), the four rising high school students, and three current high school students as we tackle gathering up their paperwork for school. Our goal is to have as much collected before Christmas as possible, however, the school year won’t start until the end of January. If we can get all their paperwork together, proving their caretakers financial need, then they may be awarded scholarships and won’t have to pay for school. Lastly, it wouldn’t be Thanksgiving without sharing one more thing we’re thankful for. So this Thanksgiving we are thankful for your prayers. We know we wouldn’t be here without the army of prayer support we feel on a daily basis. So thank you for coming alongside us and keeping us in your prayers. Previous Article Will There Ever Be Routine? Loved reading this! Felt like I was right there with you all. So thankful for all that was done! Keep up the great work!! I love you both! Praying every day and send my love.